Reprinted from the American Council of Christian Churches Special Report, Fall 2009. It appears here unedited. 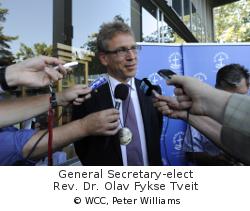 The process to elect a new General Secretary for the World Council of Churches (WCC) was marked by mystique, intrigue, secrecy, and guarded doors, with cell phones and iPods checked prior to an entrance into the William A. Visser’t Hooft Plenary Hall. Only the 140 members of the Central Committee were permitted inside. Earlier the Search Committee shared with the media that the two candidates being presented were the Rev. Dr. Park Seong-won, a Presbyterian from Korea, and the Rev. Dr. Olav Fykse Tveit of the Church of Norway. Several hours passed, and we later learned the method used in the restricted room. The first item on the agenda was for the Search Committee to give their report. This was followed by a speech from each of the two candidates. The actual voting was next. While the election was taking place, out in the lobby tables were being decorated, bottles of wine were chilled, and glasses made ready for the celebration toasts to begin. As soon as the doors were opened, the news spread rapidly that 48-year-old Dr. Tviet of Norway was chosen as the 7th General Secretary. One report indicated he had been selected by a majority vote of 80 to 60. At his first press conference, Tviet outlined his vision and goals. He began by pointing to a display on the wall near him and referring to the words that were there. They were from John 17:21, “…that they all may be one.” He stressed there had been a spirit of unity that dominated the election process and hoped it would continue. Russian Orthodox & Catholics Together? The Russian Orth. Church has chosen an ecumenical leader as its newest Patriarch. Read more about Russian Orthodox & Catholics Together? Uncertain Future for "Evangelicals & Catholics Together"
Charles Colson comments on ECT’s future in the wake of Richard John Newhouse’s death. Read more about Uncertain Future for "Evangelicals & Catholics Together"